Heat 1/4 cup vegetable oil in a large pan on medium high heat. In a large bowl combine flour, salt and corn starch. Dredge chicken pieces in corn starch mixture and carefully place in hot oil about 8 pieces at a time. Cook until golden on all side. Remove from oil and place on a paper towel to soak up excess oil. Continue until all chicken is cooked. In a small bowl, combine orange zest, orange juice, soy sauce, rice vinegar and sugar in a bowl and mix together until sugar is dissolved. Now you can either pour out the oil or use a new pan to make the sauce. Heat vegetable oil in pan on medium heat. Once hot, add onion or shallot and garlic. Cook for about 4 minutes. Add ginger and cook for another 2 minutes. Add orange jam, stirring constantly, until melted. Once melted, add orange juice mixture. Bring to a simmer. Combine water and corn starch and mix until smooth, then add to orange sauce, stirring constantly. Once sauce has thickened, add chicken and stir to coat. 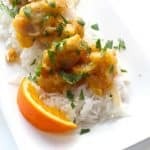 Serve on top of a bed of rice and garnish with sliced green onion or chopped cilantro.